The Holy Quran describes Jannah as “Gardens of Pleasure” prepared for the righteous believers to dwell in for eternity. It contains “all that the souls could desire, all that the eyes could delight in …” (43:71). Whoever attains Jannah has attained the “Supreme Success” (9:89). “Allah has promised to Believers, men and women, gardens under which rivers flow, to dwell therein, and beautiful mansions in gardens of everlasting bliss. But the greatest bliss is the good pleasure of Allah: that is the supreme felicity” (9:72). “For those who have done good is the best reward and even more (i.e. having the honor of glancing at the Countenance of Allah)” (10:26). Jannah is as wide as the heavens and the earth (3:133). 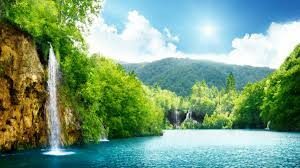 The people of Jannah will live in beautiful mansions (9:72) amidst gardens with flowing streams (2:25). Jannah contains springs (15:45), dense shrubbery (80:30), deepening shade (4:57), and bunches of fruit hanging low within reach (76:14). The people of Jannah will wear bracelets of gold and pearl and green garments of fine silk and brocade. They will recline on adorned couches (18:31) and raised thrones, and the weather will always be mild (76:13). The people of paradise will always be healthy and will never feel fatigue (15:48). The people of Jannah will enjoy the companionship of pure spouses (2:25). People will enter Jannah with their righteous family members (13:23). Angels will wish peace upon the inhabitants of Jannah (13:24). The people of Jannah will feel no resentment in their hearts. They will feel like brothers and sisters to one another (15:47). The people of Jannah will never wish to leave Jannah (18:108). They will never hear any ill speech; only greetings of peace (19:62). “Paradise has one hundred grades, each of which is as big as the distance between heaven and earth. The highest of them is Firdaus and the best of them is Firdaus. The Throne is above Firdaus and from it springs forth the rivers of Paradise. If you ask of Allah, ask Him for Firdaus” (Sahih Ibn Majah). May Allah make us the people of Jannatul Firdaus, Ameen! Really a good article Ma-Shaa-Allah I pray for Barakah in your time and life. Ameen. JazakaAllah. I hope you will keep on writing for us in future as well. Thank you so much for your positive words. May Allah give you baraka in your life too. Thank you so much for the wonderful description of Paradise! It is an encouragement, which can help us through our depression life. Jazak Allahukhairan. Wa alaikum as salam dear Sister Nahid! Thank you for your encouragement and positive comment !